Since the mid-1960's, when the Department of Defense (DoD) initiated the Defense Meteorological Satellite Program (DMSP), low, earth-orbiting satellites have provided the military with important environmental information. Each DMSP satellite has a 101 minute orbit and provides global coverage twice per day. 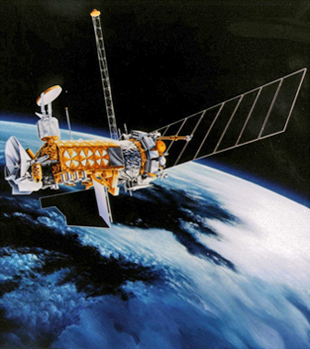 The DMSP satellites "see" such environmental features as clouds, bodies of water, snow, fire, and pollution in the visual and infrared spectra. Scanning radiometers record information which can help determine cloud type and height, land and surface water temperatures, water currents, ocean surface features, ice, and snow. Communicated to ground-based terminals, the data is processed, interpreted by meteorologists, and ultimately used in planning and conducting U.S. military operations worldwide. The DMSP is managed by the Space and Missile Systems Center, Los Angeles Air Force Base, CA. Daily operations is provided by the National Oceanic and Atmospheric Administration in Suitland, MD.